The DOS connects to any Apex via its AquaBus connection. The true versatility and functionality of the DOS comes to life via the software wizards built into Apex Fusion. This takes dosing to a whole new level in terms of ease of use as well as functionality when compared to standalone dosing systems because the DOS is part of your Apex ecosystem. Not only can you integrate it into other operations and devices you have configured, but we also will be continuing to expand on its capabilities as time goes on via software updates to Apex Fusion. The #1 reason people purchase a dosing system for their aquariums is for consistent and easy dosing of 2-part solutions (calcium and alkalinity) to their reef tanks. 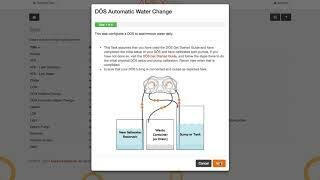 The DOS wizards in Apex Fusion take this to the next level by integrating a feedback loop from your water testing to make suggestions to fine tune the amount you dose each day. Simply put in your tank size and after a few days of entering testing results, it will help you refine your dosing amounts for the demand of your particular aquarium. No more guessing. No more fooling with the timings. With the DOS all you do is place your empty vessel and your fresh stock of saltwater under your stand. Then, with the Apex Fusion wizard just tell it amount of water you want to change over what length of time and the hours of the day you want it to happen and it figures it all out for you. It will perform an automatic, continuous water change for you. It gets better. If you have our dual optical water sensing accessory Apex Fusion will send you an email or text message letting you know it is time to change out the jugs. 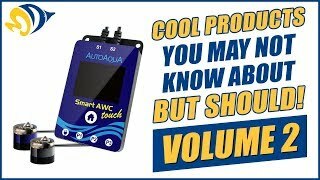 Less time pumping, siphoning, and sloshing water and more time enjoying a great aquarium. If you need to dose tiny amounts of a particular solution, element or other fluid (like vodka dosing or Zeovit systems), the DOS is the perfect solution due to its precision controlled stepper motor. This ability to control pump movement in such a refined manner means that you can dose all the way down to a single drop of fluid at a time! First, lets talk about the pump hardware. Be aware that not all dosing pumps are built alike. Well, lets clarify that. Almost all OTHER dosing pumps are alike – but most ALL OTHERS are very different from the DOS. Nearly all dosing systems on the market today use a standard, DC brush-driven motor. Why? Because it is economical. This is the same motor you might find in your child’s toy car. We thought that was just not adequate for an aquarium where you might have thousands of dollars invested. So, we spent over a year searching and testing pumps and motors and decided on using a pumps with industrial grade stepper motors in the DOS – the same type of motors used in high end robotics, 3D printing, and medical equipment. So, why does it matter? Precision - With the stepper motor pumps on the DOS, you have precise control each time you dose. And, you are guaranteed it will stay calibrated pretty much forever. On the other hand, with the standard DC motor pump found in most dosing systems, it cannot dose small quantities with ongoing accuracy and consistency. They also require ongoing calibration to account for the wear of the motor and the mechanisms. When pumps fall out of calibration, they dose either too much or too little – never a good thing considering an overdose to a tank will often be its demise. Variable Pump Speeds - One of the great features of the stepper motors on the DOS pumps is that they can be driven at various speeds depending on the purpose for which they are being used. For instance, dosing of vodka may require the slowest possible rotation while a water change use requires a much higher pump speed. The best part is that Apex Fusion wizards automatically select the proper speed based on the use and because of the stepper motor, accuracy is not compromised even at the higher speeds. Gearing and Drive Mechanism - The DOS uses a direct drive mechanism that will not slip, it will not strip, it will not grind to a halt. On the other hand, many other peristaltic dosing pumps used for aquariums have gears that can (and do) strip. Or, worse yet, some pumps work by using the friction of rubber rollers on the smooth metal motor shaft to make the pump spin. Foreign matter like salt creep, additives, etc. often get into the drive mechanisms of these pumps and make them fail or pump unknown amounts. Lifespan - The stepper-motor in the DOS has a MTBF (mean time before failure) of 5000 hours. Other systems with brush-driven DC motor pumps have lifespans measured of just a few hundred hours of use. This means the pumps on the DOS may have up to as much as 12x the lifespan of others. Leak proof fittings are very important, not just because of the possibility of leaking fluid, but also because the leaking of air into a line would cause the pump not to meter the correct amounts. The pumps on the DOS have sure-fit compression fittings that are virtually leak-proof. Contrast this to other dosing systems on the market that still use dual-barbed fittings that commonly split the tubing and cause leakage of fluids or air. Larger size tubing means that your pump does not have to work nearly as hard – or stay on for longer cycles. The most popular dosing pumps on the market use tube fittings with the tiny diameter of 1.67mm. The DOS uses much larger tubing and fittings. In fact, at 3.33mm in diameter, the pump on the DOS can handle 4x the flow of the most common pump style on the market (pictured). This means that your pump (and motor) will run 1/4 the time to pump the same amount of fluid. Less run time means less wear on the pump mechanism, tubing and motor and extends your dosing pump’s life. Larger diameter fittings also eliminate clogging – a common issue when dosing various elements like Calcium, Alkalinity, or Kalkwasser on smaller tubing pumps. Though nearly all interaction with the DOS will be done through the graphical user interface on Apex Fusion, there still is a need simplified user interface on the DOS itself. This is accomplished using a multicolor indicator for each pump to show its status as well a button to be used for priming the pump or for use during a calibration process. Changing out the peristaltic pump tubing on the DOS is a snap. Literally! All you need to do to change out the pump tubing is squeeze the pump head and remove. Then take out the tubing, replace with a new one, and snap it back on. No screws, no impossible snap on covers and no fussy loose rollers to mess with. And, because you are not changing out an entire pump head, your costs are lower as well! The DOS easily connects to your existing Apex System via an AquaBus cable. All configuration and control of your DOS is done through the Apex Fusion interface on your phone, tablet, or computer from at home or anywhere in the world! And, because there are two AquaBus connections, you can daisy-chain up to 10 DOS systems together. The DOS has an accessory port that will enable it to be connected to an upcoming optional accessories like the DDR – Dual DOS Reservoir. This accessory has two separate 2-liter cylinders for holding your additives. It also has optical sensors at the bottom that tell the Apex when it is time to refill and it then can send you an email or text alert. Another optional accessory will be a set of two optical level sensors you can install in the water change vessel (jug/rubbermaid/brute) of your choice. We understand that aquariums are supposed to be serene. And noisy pumps often ruin that mood. So our engineering team has taken extensive steps both in how the pump operates as well as the enclosure design to ensure that the DOS system is one of (if not) the quietest dosing systems on the market for the fluid volumes it delivers. The DOS was designed to compliment your aquarium – not just be a box that holds pumps. Its attractive enclosure has the pumps rotated at an outward angle to allow for the tubing to be routed with no chance of kinking, even when placed on a shelf. The DOS are also designed for stacking and they can be daisy-chained together via the AquaBus ports. Even when stacked, all tubing can be easily routed kink-free. For those that prefer a wall mount, the DOS has easy to use slots in the back so you can attach it to a wall or to the inside of your aquarium cabinet. With the exterior design, component selection, and software functionality, the DOS communicates how much total effort we have put into this product to raise the bar not only for dosing systems, but for premium aquarium products overall. I love using this as a daily auto water change system for my 8 gallon tank. It is a bit of a hassle to empty out the old water side, but still a good investment for my tank.